A group of Honduran nationals and their supporters rallied outside San Francisco's Guatemalan Consulate Friday afternoon to decry what they say are injustices being committed against migrants traveling through there on their way to the U.S. Jessica Flores reports. A group of Honduran nationals and their supporters rallied outside San Francisco's Guatemalan Consulate Friday afternoon to decry what they say are injustices being committed against migrants traveling through there on their way to the U.S.
"It's time the Guatemalan government stand up for its Honduran brothers and sisters," said Alex Mensing with the San Francisco-based organization Pueblo Sin Fronteras, a group that advocates for migrants' human rights. "The people who are currently fleeing Honduras are being forcibly displaced from their country ... and that is a direct result of the corrupt Honduran government and U.S. intervention and support for that corrupt government." According to the rally's organizers, Guatemalan authorities are criminalizing the migrants by detaining, harassing and deporting them. Thousands of migrants fleeing Honduras and other South American countries stopped in Guatemala as they continued their journey toward the U.S.
the free movement of the migrants through Central America and to respond to what they call a humanitarian crisis with aid, not increased security. 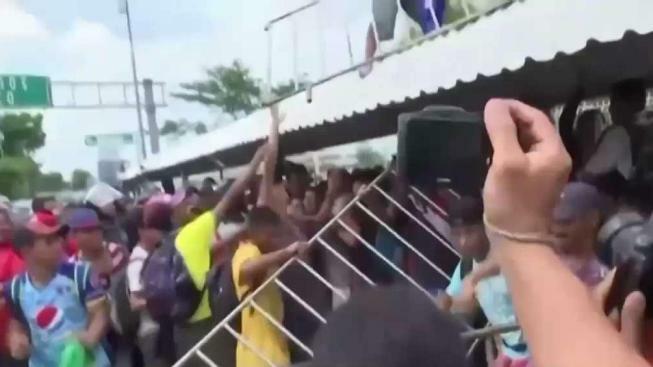 The caravan, known as the Caminata del Migrante, left Honduras last week and is trying to pass through Guatemala and Mexico to head to the U.S. It's reportedly made up of about 3,000 Hondurans who are fleeing political upheaval, organized crime and violence. Veronica Aguilar, an immigrant from El Salvador said at today's rally that she arrived in the U.S. via a different caravan last year. "I'm here today to tell Hondurans that we are with them. The people in the caravan are not delinquents, criminals nor murderers. We're people who are fighting to survive because we want a better life, a better future for our families. We want to walk down the streets with our children without fear of being murdered at any moment." Aguilar said when she first arrived to the U.S., she was detained for seven months and treated worse than she had ever experienced. Miriam Lopez, a Honduran national, said she arrived from her country to San Francisco last year while eight months pregnant, after being detained in Mexico for 16 days. Lopez said she and her siblings had to leave Honduras because people there live under constant fear of being robbed or killed. "It's really bad there. And the president says that everything is fine. It's not," she said. Lopez said she knows a Honduran family that is currently traveling with the caravan through Guatemala. "They (Guatemalan authorities) are requiring families to bring passports for their children. To get a passport is not very easy," she said, explaining that to apply for a passport can be costly and can take months to obtain. According to Mensing, some migrants with the caravan have begun crossing the Guatemalan border with Mexico and are being met with teargas from Mexican authorities. Friday, Felipe Gonzalez Morales, the United Nation's special rapporteur on the human rights of migrants, said that governments in countries where the migrants are passing through should respect their human rights and allow the migrants to pass, instead of criminalizing them and deporting them. He said that increasing rhetoric against migrants is resulting in xenophobic discourse, while "the detention of migrants is taking place on a massive scale."